This beautiful and durable half round hearth rug is the perfect addition to your fireplace. It protects you floor from harmful sparks and embers, all while providing a soft and relaxing place for your family to enjoy your fireplace. Nothing is more comfortable than this soft, 100% hand-tufted wool. 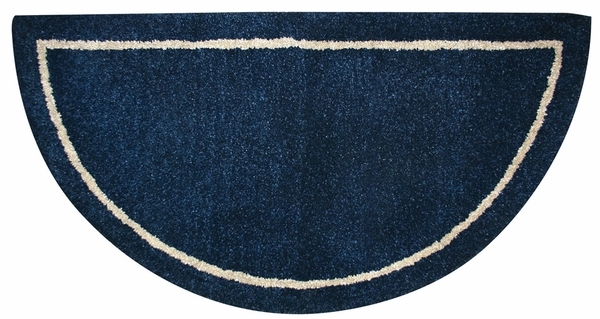 This rug features a rich deep blue color that is sure to accent many different decor choices. It is approximately 44" L x 22" W, and will last your family for years to come. Is this UniFlame deep blue half-round wood hearth rug flame retardant? This rug, being 100% wool, is naturally fire resistant. If sparks were to land on this rug, they would only singe the wool fibers. What color is the stripe? Per the manufacturer, the decorative stripe is an off-white color. How do you clean it? Can it go in the washer or does it need dry cleaning? This rug is not designed to be machine washed. It is possible to have the rug dry cleaned or it can be cleaned with a carpet steamer. Is this item flame resistant? Is this resistant to sparks? Also, is there any kind of warranty? This rug, being 100% wool, is naturally fire resistant. If sparks were to land on this rug, they would only singe the wool fibers and nothing more. These rugs by Uniflame carry a one year warranty against defects in manufacturing and workmanship. Very thick and sturdy hearth rug! Nice color, as well. Great rug! Color is perfect!! Love the quality of this rug. Looks nice and just What I needed. My cats love it too!! This deep pile, richly colored hearth rug seems to be just what we needed to suppress flying sparks from the fireplace. I wanted a dark rug so the burn marks wouldn't show. It is early in the heating season. But, so far it is fine. I received the rug in a very timely manner. The texture and thickness is nice and it looks great in front of our fireplace. The color shown in the picture is accurate, so there should be no unpleasant surprises. The hearth rug I bought is true to the color online, thick and high quality. What I've been looking for -- and spent more than a year before finding this. Just perfect in front of the wood stove, and like it so much I purchased another one for in front of the door. Great for catching the muck that comes tracking in. The website is so easy to use, and delivery was speedy. Thanks! This rug was exactly what I was looking for online! The perfect color and half-moon shape to accent my fireplace and has a great, plushy feel to it. Yes, I would recommend it highly. We thought this rug would be a great choice to protect our floor from sparks since weve gone back to burning logs instead of burning gas. We believe we made a good buy as we can tell its a quality made product. I was surprised at how well made these rugs are. They are very heavy and thick. There is no worry about a spark from my wood stove being able to burn through to my carpet. The color is realistic to what is shown on the website. I would recommend them to anyone. This rug turned out to be just what the website described and we couldnt be happier! We were very pleased to see that this rug looks much better in real life. We also love the way the wool is very soft and plush, how easy it is to clean, and how tough it is to withstand lots of use and still look as good as new. It adds a very decorative touch to our hearth area. I was not very happy when a spark flew out ofmy stove while the door was open and burned a hole in my nice carpet! Ifeel much betternow that I have this rug in front of my hearth. It covers the burn and looks just perfect.